France is obviously a very important part of my life. My first view of it was through Paris and of Tours, living in the latter for an academic year of college. I thought that I would always prefer Tours and the Valley of the Loire, but I was mistaken. Although I frankly adore it all, I am particularly smitten by Alsace and Strasbourg. So much so that when I am in Paris I have been asked if I am “from the East.” They noticed that I was using some vocabulary and also had a trace of an accent from the eastern portion of France. Having spent more than ten years of yearly two weeks or more stays in the environs of Strasbourg, I grew to love the area. I created many close friendships and had many a good time there. Because of the nature of the exchange program I worked with, I lived each time I went to France, with a teacher/colleague who exposed me to all aspects of the Alsatian/French culture while treating me like a king. I remember early on falling in love with the everyday dishes my friends would serve me on. During the daily trips we would take in the area with students, one of the stops was always the lovely town of Soufflenheim. While there we would visit the local pottery shops and get to see the making of it as well. In my visits there I became enamored of the blue variety you see in my pictures. I decided that we needed to have a set of it. I even have my favorite potter’s studio of Philippe Lehmann. One of the things I like best about it is the fact that there are variations in its production, they are not perfectly alike. From potter to potter there are variations as well. Supposedly potters have been in the area since almost 400 B.C. The local potters were given the rights to use the local clay from the nearby Haguenau forest by the Emperor Barbarossa. The large dish/plate/tray with my name and Mary Kay’s was a gift from my dear friend, Martine, one of my teacher/colleagues who stayed with us and then we stayed with her family while in France. That was quite the lucky stay since it was a Boulangerie/Pâtisserie Artisanale, which means that it was truly on top of the heap in terms of honors and they were well deserved ones at that. Needless to say, we had the most amazing culinary time you could imagine soaking up all the amazing bakery items imaginable, all while visiting with a most amazing family. Martine and my other friends, Nicole, Catherine, and Fabienne, spent much time with me and my family and exposed me to so many aspects of Alsace and Strasbourg. One thing I found out right away is that the pottery from Soufflenheim could not be easily gotten in the U.S. When I asked about shipping it, they told me that they just don’t! I checked into shipping it myself and my friend, Martine, told me that I risked getting it back home smashed to bits because the postal workers were notorious for not treating packages well. I therefore set about, in my stays there, to picking up plates, mugs, assorted pieces, bit by bit and transporting them on the plane as carry ons. Little by little, mostly just by myself, but with family members when they were with me, I picked up enough pieces to have a set of fifteen dinner plates, salad plates, etc. We use it when we feel the need for a “pick me up” because it always gives us pleasure using it. This year we decided it is our official Thanksgiving set of dishes to be used with the dirylite cutlery we have. It all looks amazing together. In France, it is advertised as being safe in the dishwasher, oven, and microwave although we take more care with it than to do that. The blue is the secondary color of Soufflenheim, I believe, the mustardy yellow being more popular. What we purchased is pretty traditional in style; they have advanced to modernizing it a bit. One of these days I need to visit the town of Betschdorf, the other famous Alsatian town for pottery. I think it is beautiful as well, it is a gray/blue combo, but it just doesn’t have the pull for me that Soufflenheim’s does. Soufflenheim is also known for being close to Sessenheim, a town where a young lady lived, who was pursued by Goethe. I believe that Goethe was known to have visited Soufflenheim with the young lady as well. One of the pictures has a piece that looks a lot like a Bundt pan. It is the mold for a Kougelhopf, a special Alsatian cake that can either be made as a dessert type with some sweetness and almonds or a more savory apéritif type variety with cheese and bacon. 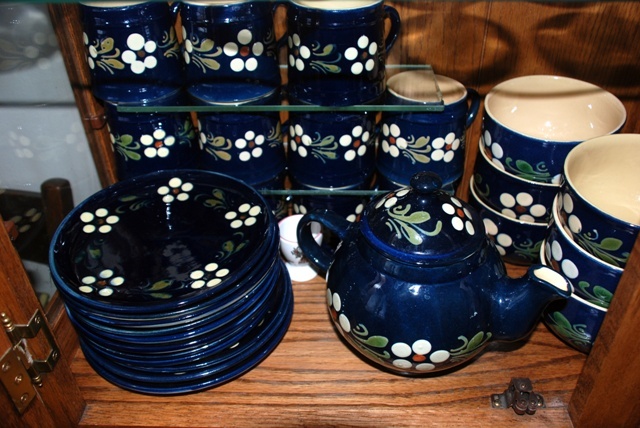 I know many people who have a piece or two of the beautiful Soufflenheim pottery, but don’t know of any other family beyond our own who has an entire set of it. At the present time, one of our salad plates bit the dust, I think I may just have to go to France and pick up another! This entry was posted in Art, Cooking, Culture, Family, Friends, Life in general and tagged French, Friendship, Paris, Strasbourg, Thanksgiving, tradition. Bookmark the permalink. Je n’avais pas lu les derniers blogs, et je viens de passer un moment sympathique à les lire: votre voyage vers la Californie et le retour….le dîner chez Marcia(je transmettrai à Jean-Frédéric ton avis sur son foie gras, ça lui fera plaisir! )….et la poterie de Soufflenheim: je n’aurais jamais imaginé que tu avais autant de vaisselle et objets divers que tu as transportés au fur et à mesure. Mes expériences de transport de poterie n’ont jamais été couronnées de succès!